Hawksbill sea turtle undergoing rehabilitation. RtoL: Dr. Andres Tello is feeding the turtle with tongs. Phoebe Edge and Pricilla Howell, DVM, are also present along with Dr. Norton (in the blue hat). The Disney Conservation Fund (DCF) supported a variety of the Jekyll Island Authority’s Georgia Sea Turtle Center (GSTC) activities in Costa Rica. Capacity building in the 3 focus areas of the GSTC – Rehabilitation, Education, and Research – has been a major goal of our work in Costa Rica. The success of this program was demonstrated on my last trip to Costa Rica where I did a sea turtle rehabilitation workshop hosted by the Parque Marino in Puntarenas Costa Rica. The Parque Marino is an aquarium that does sea turtle rehabilitation and has been the hub of our training programs. Through the DCF we have been able to support the aquarium on a variety of venues from funding and design assistance for a new exhibit, staff training, workshops, distance learning, and materials and supplies and equipment for their sea turtle rehabilitation program. Additionally, we have built a network of first responders in the Osa Peninsula, a remote but beautiful area in Costa Rica. Pictured in this image are 3 individuals that we trained at the GSTC and in Costa Rica. Dr. Andres Tello is a wildlife and domestic animal veterinarian who now responds to sea turtle emergencies in the remote Osa Peninsula. Pricilla Howell is from San Jose, Costa Rica and trained with the GSTC as a vet student. She translated Dr. Norton’s lectures during the workshop into Spanish. Phoebe Edge is a conservation biologist who now heads up a new non-profit called Osa Ecology. Phoebe has been instrumental in keeping this program moving forward and trained with us on numerous occasions in Costa Rica and the US. The turtle viewed in the image is a sick hawksbill sea turtle which was not eating and very thin. 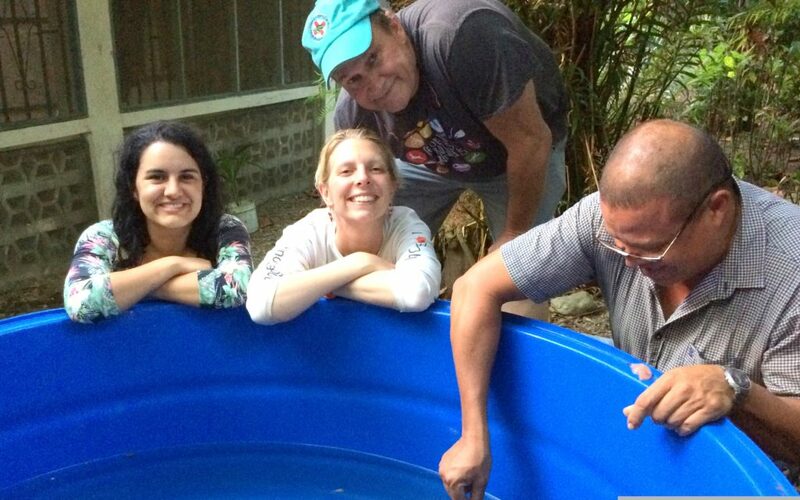 Phoebe has a tank at her home that was funded by the DCF so that injured and ill sea turtles can be treated and stabilized before transporting them to the aquarium in Puntarenas.